Visit us this fall! Enjoy the Bay, the tides, the food and the community! Welcome to Hall's Harbour Nova Scotia! 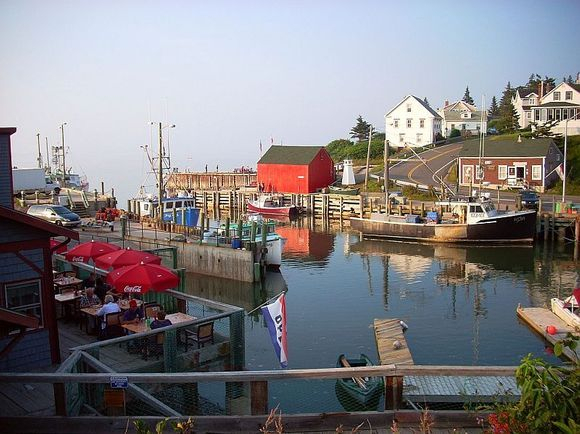 Located on the beautiful Bay of Fundy, Home of the world's highest tides. Hall's Harbour welcomes you with lovely vistas, fresh seafood and so much more! Sturdy fishing boats come and go on the tide plying the waters of the Bay for lobster, halibut, scallops and other delicasies. You can see these boats being lifted from their berths, hard aground, some 35' twice a day by the tides. Please visit the other pages on this site and the links below to learn more! The web cams are live so you can see what is going on right now! Hall's Harbour now has free WiFi! No login required!